It’s here: the raw cake of my dreams. 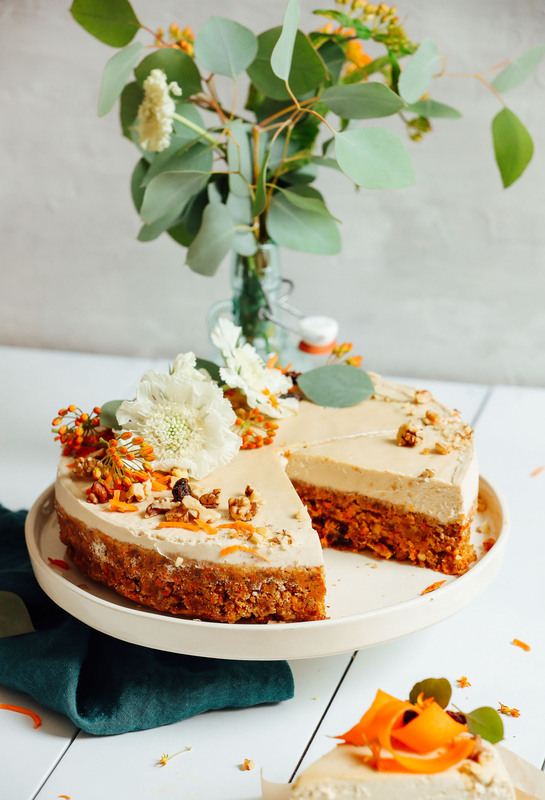 Raw Vegan Carrot Cake! It’s tender, it’s cakey, it’s naturally sweetened, it’s topped with an optional but swoon-worthy vegan cream cheese “frosting,” and it’s all yours in just 10 basic ingredients and 30 minutes. Let’s do this! The base of this cake starts with blended dates and walnuts. Then we add shredded carrots and plenty of vanilla and spices for added warmth and flavor. Once blended, transfer to a bowl to stir in the coconut flour to keep a lighter, cake-like texture. Coconut flour adds natural sweetness and lots of healthy fiber, and it also keeps this cake grain-free! Once your cake dough is formed, you can either roll into balls (like these No-Bake Vanilla Cake Bites!) or form into a cake using a cake pan, baking pan, or (our preferred) springform pan. For the (optional) frosting, we went with a cheesecake-inspired cashew cream flavored with lemon for acidity, maple syrup for natural sweetness, and vanilla. The result is a luxurious, cream cheese-esque frosting that sits thick on top of the cake. Major swoon! Once the cake is chilled, it’s party time. Garnish with whatever you’ve got on hand (we went with some flowers, carrots, and walnuts) and dig in! This would make the perfect healthier cake to have around for birthdays, baby showers, bridal showers, and more! It’s easy to make, easily feeds a crowd, and has so many wholesome, tasty ingredients. For more healthier desserts, be sure to check out our No-Bake Vanilla Cake Bites, Dark Chocolate Hemp Seed Energy Bites, 5-Ingredient V/GF Cookies, and 5-Ingredient Vegan Dark Chocolate. 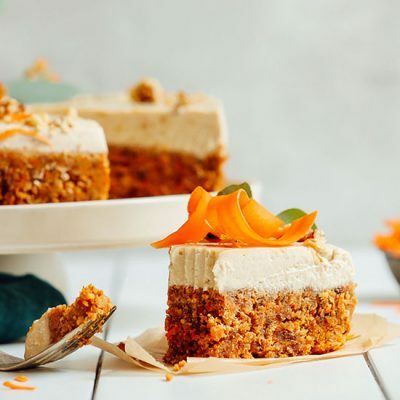 Raw vegan carrot cake made with 10 wholesome ingredients! Tender, 30 minutes to make, and topped with an optional cashew cheese cream frosting! If making the frosting (optional), soak the cashews in hot water for 30 minutes - 1 hour. Then rinse and drain. Add to a high-speed blender along with coconut cream, lemon juice, maple syrup, and vanilla and blend on high until very creamy and smooth scraping side as needed. Cover and refrigerate to chill. Using a box grater or the grater attachment on your food processor, grate the carrots and set aside. To a large (at least 7-cup) food processor, add the pitted dates and blend until small bits remain or a ball forms. Remove from food processor and set aside. (Smaller food processors can be used - the ingredients just need to be blended in batches as to not overflow the bowl. To the food processor, add the walnuts, vanilla, salt, and spices. Blend until a semi-fine meal is achieved. Then add dates back in, along with shredded carrots, and pulse in 1-second measurements until a loose dough forms and the carrots are just incorporated. Be careful not to over-blend. You're looking for a pliable dough, not a purée. Transfer mixture to a large mixing bowl. Add coconut flour and raisins and stir to combine. By mixing gently as opposed to blending in a food processor, you can keep a lighter, less dense, more "cake-like" texture. Once well combined, set aside. At this point, you can enjoy the cake by carefully lifting or sliding the cake out of its pan. However, if adding the frosting, pour the frosting on and tap out any air bubbles. Then place on a baking sheet (to keep level) and freeze for 3-4 hours or until the frosting is semi-firm to the touch. To serve, make sure the cake isn't fully frozen so it's soft enough to cut (letting it thaw on the counter for 30 minutes should help). Then use a hot knife to carefully cut out slices and enjoy. Garnish with more nuts, raisins, or other desired toppings (all optional). Store leftovers covered in the refrigerator up to 1 week or in the freezer up to 1 month. It's best enjoy slightly chilled (not frozen). You can let it sit out at room temperature up to 2 hours, but the frosting can begin to get soft. I made this while testing your various carrot cake recipes for an Easter party, and I was surprised to find that I liked this better than even the straight forward baked and frosted option! It was absolutely delicious, definitely tasted like carrot cake and while the texture wasn’t exact, it was so close it was hard to believe this was raw and refined sugar free! 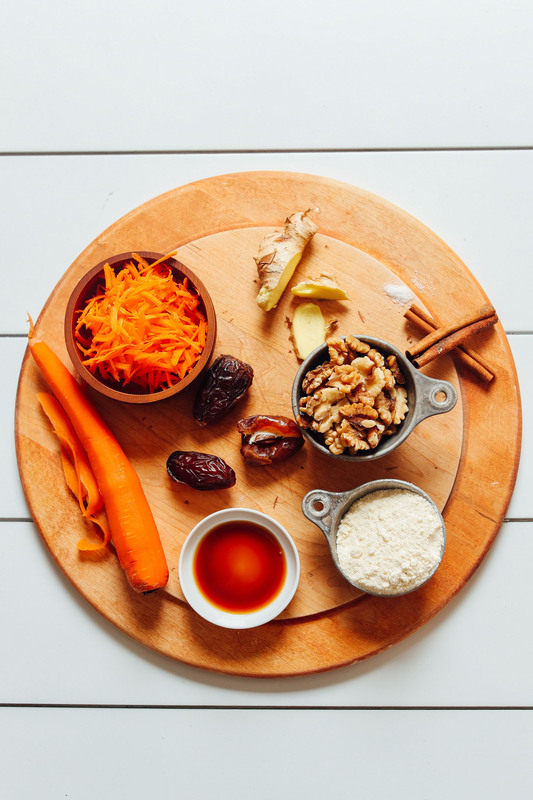 I also found it was a great breakfast, particularly before a work out– gives a good boost of natural sugars and carbs, as well as some protein from the nuts, and didn’t make me feel sick while I was jumping around in dance cardio class. Great for dessert, breakfast, and pre-workout? This is a MAJOR winner! Hi, what kind of blender do you use in the video? We used a Vitamix in the video, but have also made this recipe with this Blendtec, which is our preferred blender. Hello! Could you substitute maple syrup for honey? Hello! Can I use cashews instead of walnuts? We would suggest a blend of cashews, oats, and almonds if you can’t use walnuts or pecans. Good luck! I will be making this for my own birthday in a few weeks! This is such an innovative combination to yield a beautiful, tasty dessert! Thanks for creating! Also, I love your categories for comments (I made this/ have a questions/ just comments). As one who scrolls comments, I get frustrated when no one commenting has actually made the dish/ item for themselves. Cracks me up. I don’t have a food processor so I made this in a Vitamix and it turned out great! Dough slightly more pasty than you’d get in a processor but the flavour was still delicious so don’t let that stop you from making this! I used 2tbsp maple syrup in the icing instead of 3 and found it plenty sweet. Thank you for sharing this amazing recipe! Do you know how long the frosting will keep in the fridge? Hi Tina, we think the frosting will keep for about 1 week in the fridge. Hope that helps! I’ve been eyeing this recipe for a while and finally bit the bullet and made it. Its Valentine’s Day. What better day to make a cake for my hubby. I struggled a bit with the food processor. I’m not sure mine was big enough. It’s an 8 cup, but it just made it. I’m far from a decent cook, but the cake came out great! The icing was delicious. I can’t wait for hubby to come home and try it. He’s been teasing me about my vegan lifestyle, but I think this is just the thing to show him that I can make yummy stuff! I may have skimped on the dates. I wasn’t packing them in the measuring cup. The cake isn’t sweet like I expected, but has a great flavor and texture. I used almond flour instead of coconut flour (its what I had) and followed the recipe exactly other than that. I definitely give it two thumbs up. This was amazing. My 12 yr old son and I made it tonight. He was very skeptical because he loves regular carrot cake but I am slowly trying to introduce vegan foods so I wanted to try it. We both thought it was great and it is a dessert I feel good about giving him! We do not have a food processor and did everything with a Vitamix. Yum!! Very pleased. I followed the recipe almost exact and I used coconut cream for the frosting. Everybody loved it, planning on making it again soon. Better than regular carrot cake! Absolutely delicious. I made this yesterday for our anniversary and it’s so good. I don’t have a food processor, so I had to use our blendtec to make it, and in my impatience with small batches I over blended it so it came out more like dough consistency after adding the flour. However, after freezing, it makes for an incredible cheesecake-y carrot-cake cookie-cake type consistency and we both are devouring it with pleasure. I did add a little agave and a touch more vanilla to the icing per our palates, but that’s just preference. Thank you for an incredible recipe I will definitely make again! I make this every single weekend and take it throughout the week as my breakfast. I made a few additions to mine…I like to add unsweetened shredded coconut to the base and chia seeds. I also zest a bit of lemon into the cashew frosting and it’s perfect! 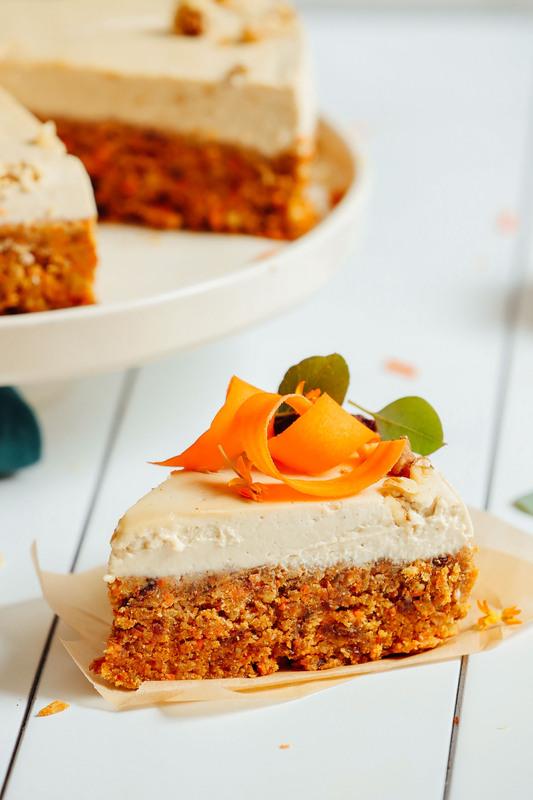 I love Carrot Cake and I have tried so many different recipes – vegan and non-vegan – and this is by far my new favourite. It was just SO GOOD. (I have never commented on a recipe before but I just had to). Thank you for this recipe (and lots of other great ones, too)! Could this be made without nuts? I am not sure you could make this recipe completely nut-free, but we have suggestions for using other nuts above in the comments! One Q, though. It says a “high speed blender’ for the icing. I’m guessing this is something even a good processor can’t quite get creamy? I tried in my mid level and even my bullet. Seems I will need to dirty a mixer regardless? Oh my goodness, I made this and just have to say, it was amazing!! Something I can’t eat too often, so I may have to freeze. Any suggestions on how to store it in the freezer? We’re so glad you enjoyed it, Ashley! Store leftovers covered in the refrigerator up to 1 week or in the freezer up to 1 month. It’s best enjoy slightly chilled (not frozen). You can let it sit out at room temperature up to 2 hours, but the frosting can begin to get soft. Hi! I’d recommend frosting the cake once you arrive at your destination for best results. You could even freeze the cake for best transport and then ice upon arrival. Hope this helps! Can I skip the ginger? Do you taste the ginger? It is subtle and compliments the other ingredients well! ohh and also saved a bit of the “dough” and made raw cookies out of them. just formed them and popped them in my dehydrator for a bit. warm, delicious, carrot cake cookies! Sooo delicious! I cut the recipe in half ( it’s ALL for me haha). I used the leftover carrot pulp I had after juicing and it turned out perfect. Thank you! Thank you so much for this amazing website. Your recipes are always delicious – always! I have yet to try one that my family hasn’t loved. You make healthy vegan food look insanely gorgeous and appetizing. I made this carrot cake for our family’s Christmas party and everyone (meat eaters and vegan alike) gobbled it up. My children actually prefer a treat like this one to typical “cake” and I’m so thankful for your recipes to help me get a little more creative! :) You’re amazing. Merry Christmas! I did it! very good cake. waiting for next occasion to repeat it. Is the nutritional info calculated without the frosting? Another delicious recipe!! Made last night and my family and I adore the cake. We love carrot cake and find that to normally buy a slice from a bakery they are dry and simply not that tasty. This cake is super moist, perfectly spiced and delicious with the frosting. This will be my go to recipe for carrot cake :) Bravo Dana, You’ve done it again!!!! I made this and unfortunately the ‘cake’ was really dry. Any idea what I did wrong or could have added to put some moisture back in? Hmm, perhaps the coconut flour was a bit too dehydrating for the moistness/freshness of your dates? Next time I’d say adding a little oil, almond milk, or more sticky dates (or soak them in water first) for added moisture! My first attempt making the vegan carrot cake I started late in the evening so I had to use Almonds because I couldn’t find raw cashews however it turned out really good the icing was dark and a little more texture than I wanted but the taste was truly amazing. Whoop! We are so glad you enjoyed this recipe! Can I add unsweetened coconut flakes or maple syrup to sweeten the cake? Does it need it? You could, but I don’t think it needs it. Let us know if you give it a try! The cake is plenty sweet with all the dates!!! I recommend giving it a go following the recipe as is and of course add a sweetener of choice if you find you’d like it sweeter the next time around… trust me you’ll be making this cake on an ongoing basis!! Can you sub kite hill cream cheese for the coconut cream? We haven’t tried, but I think that should work! I made this yesterday and cut into it today, it was absolutely divine! I cannot wait to make it for the many tables I will sit around during the upcoming holiday season, this is a winner for sure! 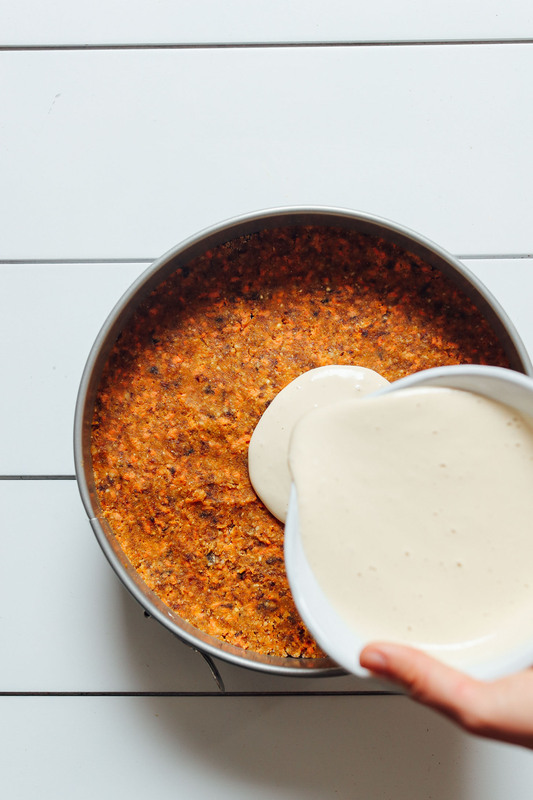 Best and easiest carrot cake ever! I see this becoming a staple in our house. Thanks for another great recipe Dana! I have a very basic baking 101 question. Is there a difference between the vanilla in the ingredients for the icing, which is just listed as vanilla, and the vanilla extract that is listed in the cake ingredients? Is the vanilla in the icing meant to be ground vanilla bean? Hoping to make this over The weekend, so hope to hear back soon :-). Hi Lauren! Great catch, they are the same (both vanilla extract) and we’ve amended that. I’m SUPER happy with the way the cake came out, but the icing… I’m not sure what’s wrong. It seems to me that the cashews maybe need to be soaked longer? Mine were soaked for about an hour and a half, and my icing will not get nice and smooth. Any tips or tricks? Is there any way to ‘fix’ the icing? I have a really good blender, but maybe it’s too small of a batch? Any advice for smooth icing would be appreciated! If anyone knows the answer to this, I’d like to know as well!! Seems like no matter how long I blended the frosting mixture the cashew frosting still seemed a bit gritty. Have yet to try the finished product, but the taste test for the cake and frosting individually taste good so far! This has to do with a blender. What kind are you using? My top two are Vitamix and Blendtec. If you’re using a Ninja, that’s likely the culprit. What is the difference in the final product whether you use coconut cream or full fat coconut milk? I don’t think I’ve ever seen canned coconut cream in my grocery stores (I’m in Mississippi) but I feel like that would be creamier. The coconut cream will add more fat so the frosting will be slightly creamier. But full fat works, well too! Especially if you use the separated white part and less of the liquid (assuming it separated). It was delicious!!!! Thank you! Hi! If I’m going to sub macadamia nuts for cashews in your frosting, do I follow the same steps/method and quantity? I have tried using macadamia nuts in frostings and can never get them creamy enough. But it’s worth a try! Just use the same methods! This cannot be any more magnificent! 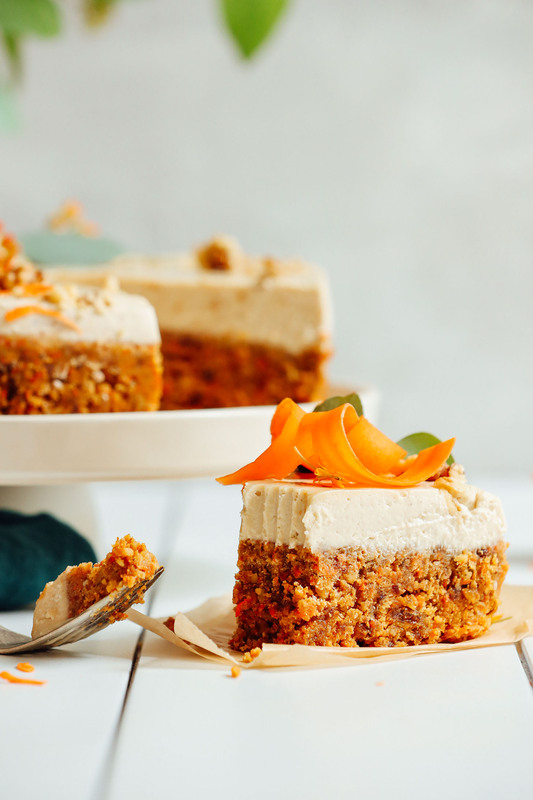 I LOVE that both layers are MASSIVE–you definitely need that sweet and aromatic cake layer with the carrots and spices alongside the decadently creamy frosting top! Who knew that raw cake was possible?! Not raw cheesecake, but actual cake! Sounds incredible to me! xo! Hope you love it! This was a great recipe! I have a small food processor so I had to mix everything in batches (a large one is going on my holiday wishlist), but it was still really straightforward and easy! Turned out really well. The cake texture was indeed quite light. You’re the best, Dana! Literally just finished making this and had to come on to say how amazingly delicious it is! I made mine into cake balls and put a dollop of the frosting on top of each one. They look super cute, all ready for coffee morning tomorrow! Thanks for the great recipe! Whoop! We’re glad to hear that, Jess! Will the frosting stay thick, and not melt, if it stays only in the fridge? I don’t want to use the freezer. Initially it’s helpful to let it “set” in the freezer or it can be a bit soft. However, after that it can be stored in the refrigerator! This looks like it would be the perfect marriage of mouth pleasure and still feeling good post-dessert! Would you be able to recommend any substitutions for cashews in the frosting? I’m not sure which other nuts would be able to deliver the desired texture. Hi Kara! We’d recommend macadamia nuts, coconut whipped cream, or a silken tofu based frosting would be nice! You are the best. A killer recipe, plus an answer to my question before I’ve even finished writing my grocery list. Thanks so much, macadamia nuts it is! Made this today!! It is absolutely the best carrot cake ever! And the best thing it is healthy and all natural and raw ingredients!! Thank you so much for this! This cake is amazing! This is my first raw cake and won’t be my last! I added grated apples to the ‘batter’ and used Tofutti instead of coconut cream for the frosting. Thank you Dana for such an inspiring recipe! Thank you for the easy and delicious seasonal dessert recipe. I made it for my daughter’s first birthday. After searching high and low for a cake recipe that was free of eggs (she’s allergic), wheat, and refined sugar, this one arrived in my mailbox just in time! Because the dry ingredients are blended down to a meal, she was able to eat it with the few teeth she has. A perfect special occasion treat for small children! I made this the other day for dessert to share with a co-worker! It is delish and feels so healthy putting it into my body. Pairs really well as dessert after your recipe for The Best Vegan Enchiladas from your cookbook. They WERE the best! And so is this cake! I’m obsessed with your recipes! I am going to make this for Thanksgiving. This will be perfect!! Yay! We hope you love it! I so have to make this cake and I can’t wait. I know it will be another favorite recipe from you. My mother even liked what it looked like and I’m trying to inspire her to make healthy foods. I am not vegan but avoid most diary and am gluten free. I love Dana’s recipes. I have make her roasted chickpeas and vegan fudge recipes over and over again. I can’t wait to try this cake! I meant can i use the frosting as cheesecake filling and bake it? :) because I’m looking for homemade vegan cream cheese recipe which can be use to bake a cheesecake. Can i use the cream cheese frosting to bake cheesecake? Are you asking if you can add the cream cheese frosting to a baked cheesecake? If so, yes, as long as it’s added after. As always, it was delicious. My very much not vegan husband even suggested that we make it for our daughter’s birthday party. Safe to say it was a hit! Lovely! Thanks for sharing, Hannah! I have not made this yet but surely plan to. It sounds delicious and easy but I have a question. I’m wondering about eating coconut flour RAW. I guess I’m fairly new to baking this way. I believe one person commented that coconut flour is not raw. Can anyone offer any more information about this? Thank you in advance. We haven’t had any issues with it, Nancy! But if it is a concern for you, you could try subbing another flour, such as almond. I loved this recipe. Made it last night for our Halloween lunch today. Not only it was a hit but I feel like this was the best Raw cake I’ve made. I made little changes but nothing major, and the cream “cheese” AMAZING. As usual, your recipes are great and I would just like to say Thank you! Yay! Thanks for sharing, Ana! THANKs FOR THIS AMAZING CAKE IDEA. Quick, have you tested, if it can be frozen?? Hi Diana! Yes, you can freeze for up to 1 month. It’s best enjoy slightly chilled (not frozen). You can let it sit out at room temperature up to 2 hours, but the frosting can begin to get soft. If i reduce the recipe by half will that change the texture/consistency? As long as you reduce all the ingredients equally, that should work just fine! This looks fabulous and I’d like to make it and not waste ingredients on a long experiment phase. What I’m about to ask is crazy, even for me. I’m vegan, allergic to corn and soy and am very adept at substitutes. Usually. Unfortunately my daughter has recently developed an anaphylactic allergy to cinnamon. Cinnamon?? Seriously? Yep. I’m now trying to figure out alternatives. I’m thinking nutmeg or allspice or cardamom. Does anyone have ideas on measurements? I’m open to suggestions and won’t blame others if it fails. I’ve used cinnamon in my recipe but if you add allspice, nutmeg and Clove powder (all 1/2 tsp each) I think it would work wonders, also freshly grated ginger are fabulous. I used all these spices in the recipe and it turned out great. Hi Tia! I’d recommend trying allspice in place of cinnamon. When using allspice as cinnamon substitute, use a third of the amount of allspice that the recipe suggests for cinnamon. Hope this helps! Thank you, both! Greatly appreciated. Hi Megan! 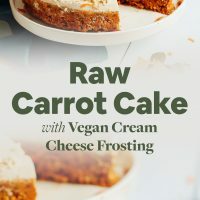 There are many versions of raw carrot cake available online now (and after checking I did see that ours does have several different from yours). But I can assure you we were not aware of your recipe and took no inspiration or elements from it. We came to it by trial and error and from past experimentations with raw cakes and nut balls. All your recipes just work and this is another fantastic one. Made it last night for dessert for the family and was a hit with them all. Served with raspberries and a dollop of ice cream for my husband. So healthy – makes you feel good inside after eating. Thank you – keep those yummy recipes coming. Did you use a 7 in. Spring form pan? We used a 9 in. Spring form pan and it turned out thinner. We all had it for breakfast and it was delicious! We used a 7″ pan! We’re glad you enjoyed the recipe, Lynda! Every time I look at Dana’s recipes and videos, I’m struck by how beautiful and professional everything looks. Of all the vegan recipe authors I follow (probably over 20), Minimalist Baker is my favorite. First, FLAVOR. Everything she does tastes soooo good. Next, simplicity. I just can’t spend hours in the kitchen, and these recipes are pretty, well, minimalist! Next, beauty. So much style. Thank you, Dana, for making things so delicious, so easy, and so beautiful. I’ll let you know how this goes. I’m so excited to use up the local carrots in the refrigerator! Also, having a few celebrations this month is the perfect reason to make something that sounds so delicious and healthy. Thank you for your creativity. The pictures are awesome! Could I substitute the walnuts with almonds? I’m allergic to walnuts and pecans. Recipe looks amazing, definitely plan to try it this Thanksgiving! I’d suggest a blend of cashews, oats, and almonds if you can’t use walnuts or pecans. Good luck! we cannot make or bake anything with tree nuts. Would you suggest something else like sprouted watermelon seeds? or a combo of those and Sunflower seeds? I have to try this. going to add a little fresh grated turmeric to mine. Just love that it is no bake. Wish my 30th birthday would come sooner, so i can make this for myself. My daughter is allergic to cashews (and pistachios) as cashews seem to be the main nut used for vegan creams, especially in desserts what nut could I substitute, thanking you. Patricia that’s a great suggestion. Otherwise, coconut whipped cream or a silken tofu based frosting would be nice! Hi there, wondering if it’s possible to sub a less expensive date rather than the mejool? Just a mention that the video says “3 Tablespoons of vanilla” and “1 teaspoon of maple syrup” instead of the other way around. I’m sure most people will read the recipe and not just follow the video but it might lead to a disastrous result if they do haha. Oh, thanks! Will amend that. Maple syrup isn’t raw. And coconut flour, milk and cream are processed so don’t really feel this is a raw recipe. Thanks for the feedback! I’d still consider it kosher in raw recipes, even though it technically isn’t raw. But you could sub raw honey if that works better for your needs! Wrong. If you’re a raw foodist you should know there are raw coconut flours on the market or how to make it yourself. The definition of RAW is that the temperature remains below 118 degrees NOT that it’s “not processed”. Ditto for the coconut MILK and CREAM. I make them in my Vitamix like nut creams/milks. They’re still RAW. hello! Do you get a strong raisin flavor from this cake? I hate eating raisins on their own. Would you recommend a substitute, or to just go with it? Love your recipes!!!!!!!!!!! I first got on the Minimalist Baker train with the sweet potato buddha bowl and I’ve been on board ever since. Dried cranberries should work, imo. xoxo! The raisins don’t add a strong flavor, but can also be omitted. xoxo! This looks amazing. I’d like to get the sugar count a lot lower. I’ve used monk fruit and yacon in recipes before. Do you think either of those would work here? Thank you! Hmm, I’d think so? But most of the sugar is from dates, which also provide plenty of fiber and minerals. Hopefully that helps! I notice you use maple syrup to sweeten in most of your recipes. Does honey work as a sweetener instead of maple syrup without any issues? My guess is she does not use honey because honey is not vegan. Besides maple syrup, I like molasses and agave to sweeten (the former has that thick sticky texture that helps hold things together). Thanks. It makes sense but there is debate about honey being vegan or not. I’m ok with it besides it’s more nutritious. I call it ‘beegan’. I made it with Maple syrup. Quick, easy and Delicious!! Honey isn’t vegan, but you could use agave! Hi there! Maple syrup and honey can be used almost interchangeably – thanks for asking! I made it last night with maple syrup and it came out too sweet and too soft. Otherwise delicious. This looks wonderful, I can’t wait to make it! Question about the flour – will Bob’s Red Mill GF-AP flour or rice flour be a good substitute if I don’t have any coconut or almond flour on hand? It won’t have the same texture, flavor nor nutritious value as coconut or almond flour lends to it. Besides it won’t be the same density. You will have to adjust quantity and bake it. Not a good idea. It changed the whole recipe. I would recommend the coconut flour as it has a cakey flavor and texture, and adds a bit more sweetness. If you try other substitutions, let us know how it goes! Hi—recipe looks amazing. I just have IBS and can’t deal with dates. Is there anything that I could use to replace them? It’s so hard considering the unique consistency of dates! Thank you! Would apricots work as a substitute for dates? Hmm, it would completely change the flavor. But let us know if you try it! I love how you can change the amount of servings and the recipe amounts change accordingly! This cake looks amazing! So soft, rich and delicious! 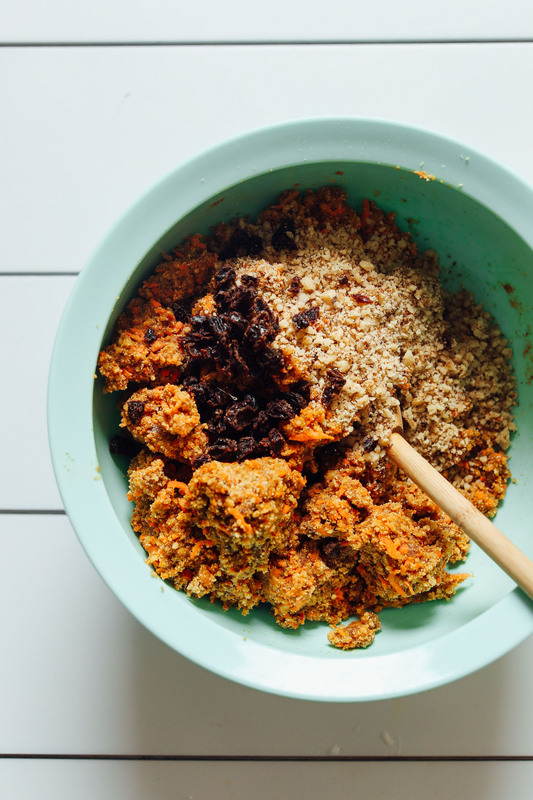 This looks awesome and I’m looking forward to making a healthy vegan carrot cake! I have a simple question for you. The photo shows fresh ginger, but the ingredients say “ground ginger” which typically means dried/powdered ginger. Should I use dried ginger or fresh, grated ginger? You can use either! The fresh ginger photographs better. But both work! Almond or cashew milk would work! I was thinking the same! My bday is 11/7…when is yours? I’d say a blend of seeds, oats, or coconut would work well! Love this!!! Vegan, raw, healthy and sweetened with my favorite kind of dessert, dates!!! Beautiful recipe and cake! This look delicious even though Im not a big fan of dates!!!! !